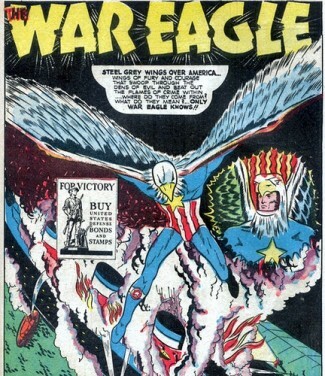 Let’s be honest, of the huge crop of patriotic heroes created after the attack on Pearl Harbor, Simon and Kirby’s Captain America was the best. But when Cap is busy – and it sounds like he’s going to be busy on the silver screen in a couple weeks – one of these heroes could probably stand in and save the world for democracy in his stead. Don Wright is the publisher of the Daily Bulletin in Central City IL. He decides to put on a costume to help the downtrodden and oppressed, and eventually falls into the business of thwarting Axis saboteurs. His sidekicks are four children known as the Young Defenders: Lefty, Slim, Whitey and Joanie, all newsboys for the Daily Bulletin. Captain Freedom often teamed up with Black Cat and Shock Gibson, including in the defense of Los Angeles from a Japanese invasion force. Pilot Dan Lyons crash landed near the Rocky Mountains near the laboratory of James Norton, a reclusive scientist. Norton revives Lyons with his Cosmic Ray Lamp, which also enhances his physical and mental abilities. Norton convinces young Lyons to fight the Axis on their own turf, which he does. Man of War is the son of the god of war, Mars, who decides to send his son to help the warlike Germans during World War II. But Mars miscalculates the rotation of the Earth (math was never his strong suit), and his son ends up in Dayton, Ohio. The boy rejects his father’s ways and instead fights with the Allies. He is equipped with the Flaming Sword of Mars that can cut through anything. His power are derived from rays that shine down from the planets; lead blocks those rays and robs him of his powers. Joan Dale falls asleep visiting the Statue of Liberty and dreams of all the good they could do with her powers. She awakes with magic powers, which she uses to fight criminals and the Axis. The Unknown Soldier appears like a bolt out of the blue to fight for freedom and democracy. Bill Reed was a victim of infantile paralysis, but he becomes determined to build his upper body strength. He succeeds, but his lack of mobility really crimps his style with the ladies. He begins a new regimen to unlock the secret of winged flight, and finally to defeat his paralysis by practicing jumping and landing. A wealthy man, he decides to devote his life to fighting crime and destroying the Nazi threat. Yankee Doodle Jones is a Frankenstein monster, created from the bodies of three crippled American veterans by a mysterious scientists using a secret fluid. After the scientist is killed by Nazi agents, Jones and the scientist’s son, who injects himself with the fluid, fight back. The scientist dies, but not before he urges to two to become super heroes. They have teamed up with Yankee Boy and Johnny Rebel.